Buy Clublaptop 3 in1 laptop care kit (Laptop Cleaning Kit+ 15.6 inch Laptop Screen Guard+ Laptop Skin) online - Clublaptop - The largest online store by Manufacturer of Laptop Accessories and Spares. 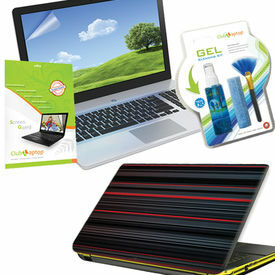 Clublaptop brings you the best care kit for your laptop. The most vital parts of your laptop & the laptop screen, laptop keyboard the laptop panel can now be scratch free with Clublaptop Laptop Care Kit Combo. Clublaptop laptop screen guard is designed professionally to keep your laptop screen scratch free without compromising on display. CL laptop screen guard protects your eyes from ultraviolet rays. It is 100 percent transparent, and will give you a wonderful visual experience ensuring safety of your delicate laptop screen from external encumbrances. CL laptop screen guards comes in 3 layers & are made from high quality non-sticky material and can be easily removed without leaving any residue behind. Flaunt Your Style - with our innovatively trendy, glamorously stunning and fashionably exciting laptop skins. Clublaptop LSK CL 43 Vinyl laptop skin is custom designed and printed to perfection to reflect your attitude and style statement. It is absolutely stunning in look and safe to use on your laptop. This Laptop skin is made from premium material to give amazing look, finish and ensure long life to your laptop. Have it, flaunt it. Clublaptop Laptop Cleaning Kit is a specialized gel base cleaner, formulated from organic extracts instead of alcohol and acetone that may have corrosive effect on Laptop screens. This new improved non-drip gel will not flow into spaces between the screen and its casing, unlike other normal alcohol based cleaners available in markets that very often does so leaving screen and other components damaged. It comes in a set of three: Non drip alcohol free and acetone free gel. Antistatic Brush - reaches out in gaps of keypads and removes dust effectively. Micro fibre cloth - ideal for removing stains and oily fingerprints without scratching your laptop or LCD Screens. It can be used for multipurpose and is ideal for Laptops, LCD TVs, Tablets, Digital cameras and Mobile phones.